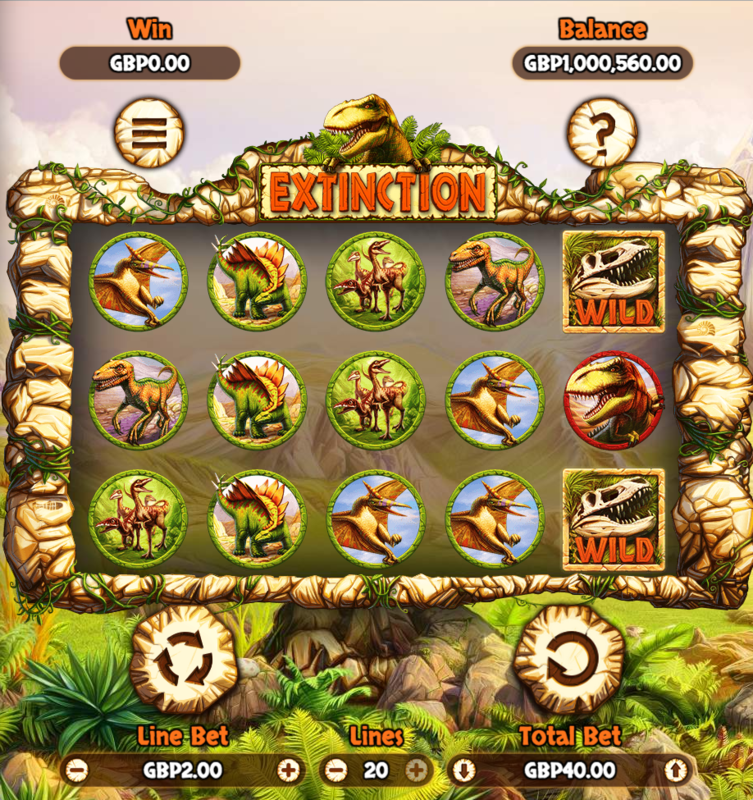 Combining dinosaurs and disasters is always going to result in a winning mixture and that’s the attraction of this high quality online slot from Odobo/Wild Game Reserve. It’s called Extinction and it’s based around the K/T extinction event which polished off the dinosaurs around 66 million years ago – bad news for them but a great theme for this game. Extinction is a five reel slot with three rows and up to twenty paylines; the design is prehistoric with the reels set in stone while a Tyrannosaurus Rex observes from above; mountainous terrain and a cloudy sky complete the background picture. Nine different dinosaurs represent all the main symbols and with the help of the paytable we think we can identify a T-Rex, an Apatosaurus, a Velociraptor, a Triceratops, a Stegosaurus, a Pterodactyl and a Compsognathus; there are also a couple of smaller creatures which seem to be a Trilobite and a giant Dragonfly. All these symbols can appear stacked on the reels. The wild symbol is represented by the skull of a T-Rex and it substitutes for all others except the scatter; that scatter is the meteorite which kicked off the extinction. When the spins are underway, a group of meteorites will hit the reels after each spin – each one that lands will turn that position wild after which there’ll be a re-evaluation to check for any new wins. There’s some big wins available here if those wilds land in the right place to help out. More spins can be triggered by landing more scatter symbols. 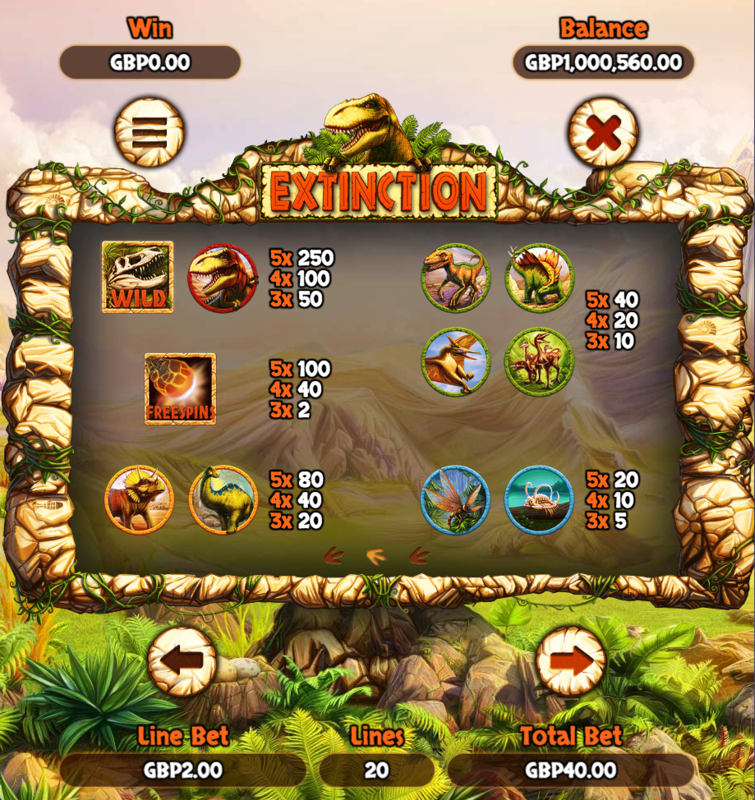 Extinction is a very high quality slot with some great graphics and animations; the big wis are certainly in the bonus round but it’s reasonably easy to trigger. This game has an RTP of 96.34%.